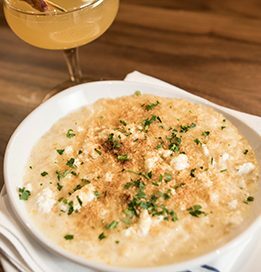 Where to find good grub after 8 p.m.
Finding a place to eat a satisfying meal late at night in Salt Lake City can be a challenge, especially if you’re craving a little comfort in food that’s not served in a paper bag. There’s an abundance of good food everywhere in the area for breakfast, lunch and dinner, but what can you do if you’re needing to nosh later than the standard 7 p.m. dinner time? Maybe you’re off at 8 p.m. from your swing shift. And what about the times you forget to make a restaurant reservation before heading out to a concert or the theater? Then, there’s the case of time ticking: Dinner was three hours ago, and you’re hungry again. You’re craving something heavier than a snack, but lighter than a full meal. If this sounds like you, here are some thoughts on where to find good late-night food after the streets have been rolled up and stored away. A neighborhood bakery serving late night plates seems unlikely, yet Gourmandise The Bakery is just such a spot for small plates, dinner and wine. After 8 p.m., Gourmandise offers late-night small plates with simple, real food void of pretentious overtones. It’s ideal for out-of-town guests when they want something good to eat, along with a little bit of something sweet to take home for later. 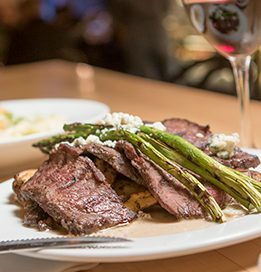 Choose the tri tip with fingerling potatoes and asparagus. While filling, it won’t weigh you down due to the smaller portion and the light herb sauce. Fresh-roasted asparagus topping the dish rounds it out to feel like a legit supper. The vegetarian lasagna stuffed with layers of summer vegetables is light and fresh, while the soups, according to the servers, are the most popular with regular customers. The tomato basil bisque and French-onion soup are so popular that they never rotate off of the menu. If you’re lucky, there still will be some daily-baked baguettes for dipping. The double case of tarts, pies and pastries will likely tempt you while you wait for your meal. Impossible to resist is the almond chocolate-dipped horn. The top layer is coated in almond slivers and crisp on the outside, while chewy-on-the-inside. Half of the confection is then dipped in chocolate. It’s just enough of a sweet bite late night, and also very nice dunked in coffee. Hours: Monday-Thursday 7 a.m.-10 p.m.
Friday and Saturday 7 a.m.-11 p.m. Sometimes the only thing you can think about when you get the late-night munchies is really good Chinese food. With descriptive flavors listed on the menu to help you decide what might hit that crave: sweet, spicy, salty and sour, Chef Gao delivers within three miles of its location in Midvale. But walking into the restaurant past 9 p.m. will take you right into a Chinese-American time warp. The décor will transport you elsewhere, but there’s no denying the Sichuan and authentic Mandarin cuisine. There’s an overwhelming selection of late-night options—60, to be exact, for $5.49 (cash only). You could go there a dozen times and still not try everything on the menu. Do try the noodles, which are tasty and perfectly cooked, with or without broth. Shanghai fried noodles include stir-fry noodles with shredded pork, cabbage, bean sprouts and onion. Noodle soup and mustard greens are satisfying with just the right amount of saltiness to complement the bitter greens. Be forewarned: Soups are served in a large bowl—enough for sharing with two or three other people. 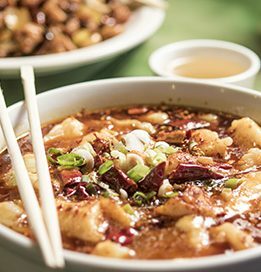 You’ll find more exotic offerings like ham and winter melon soup, soft tofu and fish fillet in hot sauce, as well as the more familiar items like Mongolian beef, salt-and-pepper ribs or Shanghai style fried rice. Hours: Monday-Thursday 11 a.m.-11 p.m.
Friday and Saturday 11 a.m.-11:30 p.m.
Flemings Prime burger at the Gateway is a late-night treat and hard bargain to beat. Yes, sometimes the sun goes down and the thought of a juicy, delicious full-sized burger is the only thing that’s going to satisfy your hunger pangs. 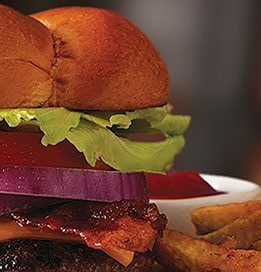 If the glare of office lights and computer screens have you a bit unfocused, order the burger at the bar. The quality/price ratio is hard to beat in Utah: Eight dollars normally and only six bucks before 7 p.m.. For that low price you get a 100 percent Prime beef burger served with peppered bacon, cheese, plus delicious fresh fries. You’ll leave happy. No doubt, there’s still a void in the late-night diner scene since Bill & Nada’s closed shop years ago. You won’t find their calf brains and eggs here, but you can get a tasty, hot, open-faced diner-style sandwich or a slice of pie at the Little America Coffee Shop. 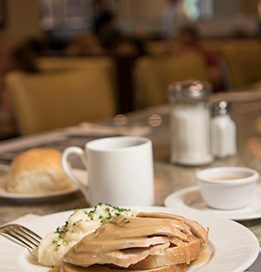 The diner still dishes out its famous hot roast turkey sandwich, with thick slices of white bread served open-faced with white-meat turkey, heafty gravy, mashed potatoes and cranberry sauce. Who says turkey and gravy is only for Thanksgiving? Little America’s will satisfy your craving for comfort food. Hours: Monday-Saturday 6 a.m.-11 p.m.
Let’s be real: All too often, work turns into a double-shift. When that happens, pub food (and drink) can be the perfect solution, and Red Rock Brewery offers some nice nighttime options. Many of my chef friends, when asked, recommend Red Rock because it’s a great place to get a quick bite, the food is consistent, and there’s always good beer. Sure, chefs like to explore what other chefs are doing, but not late at night. 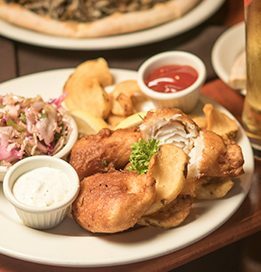 They like kicking back with reliable, honest food, and that’s what you’ll get with a Red Rock Oatmeal Stout and the delicious beer-battered halibut and chips. Another nice option is the wild mushroom pizza, served piping hot from Red Rock’s wood-fired pizza oven. Hours: Sunday-Thursday 11 a.m.-11 p.m. If your heart is set on a late-night supper of fresh, local Greek food, Manoli’s is a great choice. In a quiet segment of a residential Sugar House neighborhood, you’ll find a little modern Greek gem. Guests can choose a table or pull up a chair at the counter with views of the open kitchen, but this is the opposite of a classic Greek-diner atmosphere—so don’t think gyros or souvlaki. Try kakavia: perfectly cooked shrimp and scallops nestled in a bowl of simmering tomato/wine broth. Or, maybe vegetarian orzo with white cheddar, Parmesan, feta, caramelized onions and bread crumbs. Manoli’s food is subtly comforting, satisfying and nicely balanced. If it’s a salad you’d like, the braised beet and watercress is lightly tossed with pomegranate vinaigrette and pairs nicely with lemon rice with yogurt; you’ll still have room for an order of the amazing chocolate cardamom ice cream. No late-night list would be complete without a pizza recommendation, and for that there’s the Pie Hole. It’s small, it’s funky, and it rocks until really, really late. 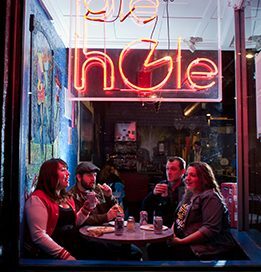 Wedged into a busy downtown strip of State Street near some hopping night spots, Pie Hole serves pizza by the slice or as a whole pie. 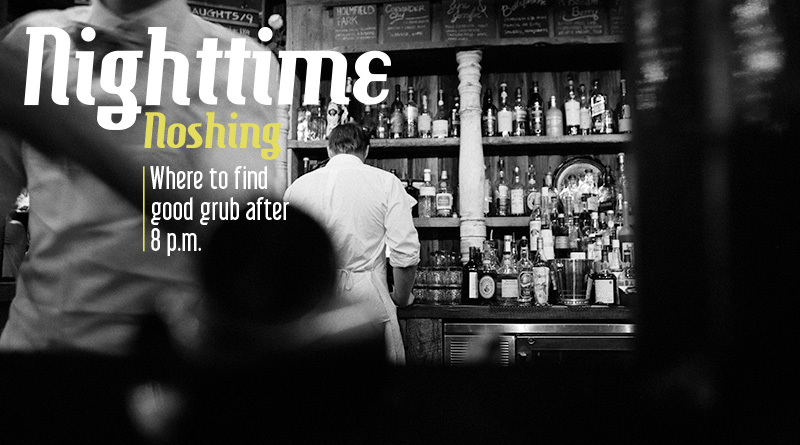 It’s a place where you’ll likely eat fast and dash, probably post-clubbing. Hands-down, the late-night menu winner is the potato-bacon Alfredo pizza. While scanning the crowd one night, I asked pizza maker Nate, who was serving slices, “why this particular pizza, at this particular hour?” He said it best: “Because it’s breakfast and dinner all wrapped up in a pizza. It’s awesome!” Can’t argue with that. Hours: Sunday-Thursday 11 a.m.-2 a.m.